Many moons ago, Native Americans in the Pacific Northwest discovered the pleasures of planking—cooking fish on wood over a smoldering fire. Plank grilling is easy. It’s fast and tastes phenomenal. Start with precut wood planks from Russell Veggies or get some from the local cooking stores. Cedar, cherry, hickory, pecan, maple, apple and alder work best. You’ll need approximately 1-inch-thick wood cut to fit your grill. Kenny’s planks come from local Indiana cedar, milled right here in Floyd County. For more flavor add 1 cup of citrus juice, apple juice or wine to the soaking water. Keep a water bottle handy to tame sudden flare-ups. Go for sturdier fish when grilling or planking. Trout, salmon, bluefish, swordfish and striped bass are tasty choices. Resist the urge to flip the fish; just let it be. Soak planks in water for 3 to 4 hours. This helps create an aromatic smolder and slows the burning process of the wood. Heat a gas grill to 375-400°. (If using charcoal, let coals burn until covered with white ash.) Place one wet plank on grill rack, cover, and let char for about 10-15 minutes. Toss slices of onion, zucchini and sweet bell pepper in olive oil, kosher salt, coarsely ground black pepper and a pinch or two of dried thyme. Flip charred plank and place vegetables on it. Place second wet plank on rack. Grill vegetables, covered, until tender and lightly charred, about 25 minutes. Meanwhile, drizzle fish with olive oil. Shower with salt, pepper, 1 tsp. coarsely ground celery seed, and the juice of a fresh lemon. When the second plank has charred about 15 minutes, flip it, and place the fish skin side down on it. Close grill cover. 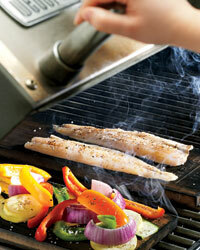 Grill until fish is cooked through and reaches 135° at the thickest part, or when it flakes easily with a fork. A 6- to 8-ounce ½-in.-thick fillet takes about 6-8 minutes. Slide a wide metal spatula between the skin and the flesh. The skin will stick to the plank, allowing the fillet to lift easily.